The extremely welcome unification with Champ Car gave the 2008 IRL IndyCar Series its biggest fields in years and unprecedented strength in depth. But despite (almost) all of American open wheel racing's biggest names finally sharing a single grid again, the 2008 championship battle soon became all about one man: Scott Dixon. It was a year full of milestones for Ganassi's Kiwi driver: he took the first win of the unified era at Homestead, claimed his first Indianapolis 500, and added a second title to the championship he had won in the similarly pivotal 2003 season, the first year after the initial exodus of major Champ Car teams to the Indy Racing League. Once again, Dixon raised his game to meet the new challenges, and whereas 2003 had seen a thrilling five-way title battle, this time he took the series by the throat early on and never looked like losing his grip. A six-time winner in a season when no-one else hit Victory Lane more than twice, Dixon was on the cusp of wrapping up the title with three rounds to spare. Only some surprising late strategic wobbles by Ganassi and a tenacious last-gasp charge by Penske's Helio Castroneves kept the battle open until the thrilling Chicagoland finale. Ultimately though, fate always seemed to be firmly on Dixon's side in 2008 - as the Homestead opener proved. He took pole and emerged victorious, but only after leader Tony Kanaan was collected by a spinning backmarker with seven laps remaining. Dixon then retired at St Petersburg and had to settle for podiums at Motegi and Kansas after yellows fell inconveniently for his fuel strategies, although he could easily have won at both ovals and arrived at Indy with a commanding series lead rather than trailing the consistent Castroneves by six points. 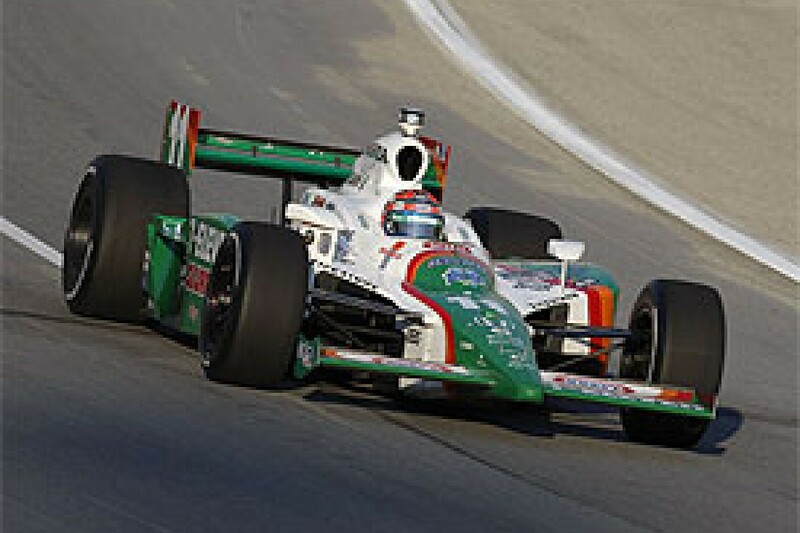 At this stage a four - or perhaps even five - way title battle looked in prospect, with Andretti Green's Tony Kanaan and Dixon's teammate Dan Wheldon also within 15 points of Castroneves after four races, and Danica Patrick lurking close behind. But his commanding Indianapolis win started a superb run for Dixon, who won four of the next nine races and only missed the podium twice in that period. Watkins Glen was the one true blip, his unbeaten run at the classic road course ending when he inexplicably spun under yellow late in a race he looked set to win. Elsewhere, everything went spectacularly right for Dixon. He took the lead at Texas just before a tangle between his main rivals for victory caused the race to end under yellow. He jumped the hitherto dominant Penske pair at the final stop at Edmonton and held on to win. He grabbed victory at Kentucky as Castroneves' car spluttered, out of fuel, at the very last corner. Even Mother Nature was a Dixon fan: he missed a pit call in Nashville and accidentally took the lead - only for a storm to then hit the track and hand him another win. Rain at Iowa also gave him pole on a rare off-the-pace day, and from there he clung on for fourth. The title was clearly destined to be Dixon's. By mid-August, he was 78 points ahead and the competition had wilted. Wheldon won at Kansas and Iowa and was rarely far from Dixon on the ovals, but a late-race loss of pace at Indy and consistently poor results on the road and street courses saw his title challenge fade. His road course tribulations were bizarre considering his grounding in Formula Ford, Atlantic and Indy Lights, and that he had won the series' first ever street race at St Pete in 2005, when still with AGR. At Ganassi, however, Wheldon never seemed to click with the road course setup and invariably scrapped over the lower top ten places at best. That was a major factor in Ganassi's decision to drop him in favour of the returning Dario Franchitti for 2009. But Ganassi's first choice had been Kanaan, who appeared to be on the brink of a dramatic 2009 team switch until opting to stay at AGR after all, although he will be without his long-time engineer Eric Cowdin, who is heading for Penske after working with Kanaan since Indy Lights. As the team's sole remaining veteran, Kanaan was always going to be AGR's lynchpin this season - coming into the championship with 174 top level open wheel starts under his belt, compared to his three young teammates' combined tally of 79 IRL races. And he remained AGR's main hope throughout a fractious year that was summed up by the vacillation over his future and the post-race tension at Indy, where Kanaan felt teammate Marco Andretti had put him in the wall as they battled for the lead. Andretti began the year strongly by fighting for victory at Homestead, but failed to win a race and had too many retirements, including some embarrassing first-lap crashes on ovals. Patrick hoped her historic Motegi win - which was fully deserved, despite being earned through strategic stealth not raw speed - would catalyse a title challenge. But although her consistency placed her sixth in the standings, she didn't get on the podium again and only occasionally (mostly on the large ovals) did Danica look a potential winner. More often, she would hit the headlines for either giving or receiving criticism about track manners. Kanaan was normally a step ahead of his teammates and stayed in the title hunt until Sonoma, but twice crashed in races he could have won (Indy and Iowa), and regularly lacked the final ounce of speed needed to challenge Dixon. His flawless performance amid the chaos of Richmond would be his sole victory of 2008. 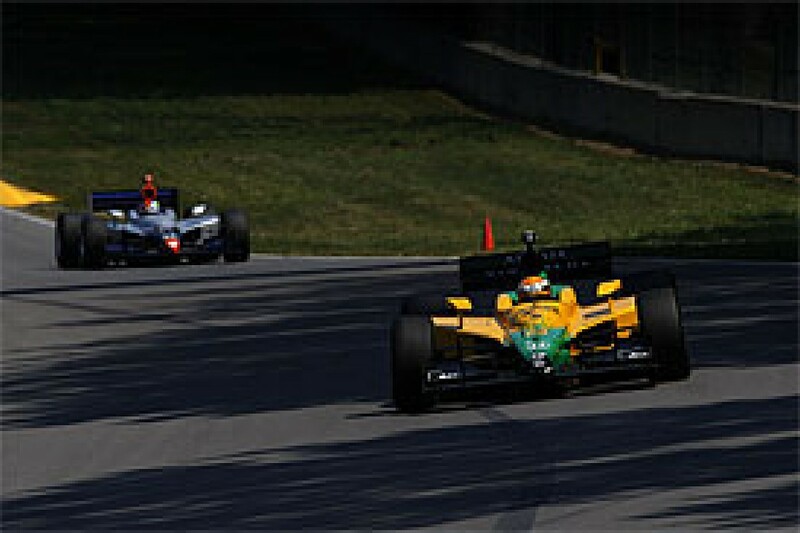 Though others won, no-one else had the consistency to produce a title challenge - not that Watkins Glen victor Ryan Hunter-Reay was ever expected to do so with Rahal-Letterman Racing, whose fortunes had stagnated prior to the American's mid-2007 arrival. Hunter-Reay snapped at the big three teams' heels at every type of circuit, and could have won at Texas too but for a late crash with Andretti. He didn't have the equipment for a championship bid this year, but proved he has ample ability. As did Ryan Briscoe, once he had got over an error-strewn start to his Penske career. Taking Patrick out in the Indy pit lane was Briscoe's nadir, but also his turning point, for he bounced back superbly to win the next race at Milwaukee. Another victory followed at Lexington, and he proved to be more than a match for teammate Castroneves as he climbed from a dismal 19th place in the standings post-Indianapolis to finish the year in fifth. The late unification meant a swathe of talented drivers and teams began 2008 knowing the title was out of the question, but the Champ Car converts proved their class in adversity. Newman/Haas/Lanigan won with Graham Rahal at St Pete and Justin Wilson in Detroit, while Rahal was the first of the newcomers to get amongst the leaders on the ovals, where his regular crashes didn't detract from his speed. Wilson was generally less comfortable with oval racing, although his ninth place at Kansas was one of the drives of the season given his inexperience at the time. On raw pace, KV Racing were often the fastest transition squad, but sustaining that speed on race day and avoiding errors or failures proved harder, so neither Will Power nor Oriol Servia reached the podium. The change of series stretched even mighty Newman/Haas/Lanigan to its limits, yet the smaller Champ Car teams also impressed. Sponsorship problems hurt Conquest Racing after a strong start, with the very promising Franck Perera forced to depart and Alex Tagliani arriving too late to turn things around this year. Bruno Junqueira had some outstanding days for Dale Coyne (particularly Indy qualifying and his charge from the back in Detroit), and his extremely inexperienced teammate Mario Moraes also shone as the year progressed, although too many eye-catching performances ended in crashes. That also applied to HVM's EJ Viso. The spectacular Venezuelan has some rough edges to attend to - many veterans found going wheel-to-wheel with him a hair-raising experience - but his potential is huge. 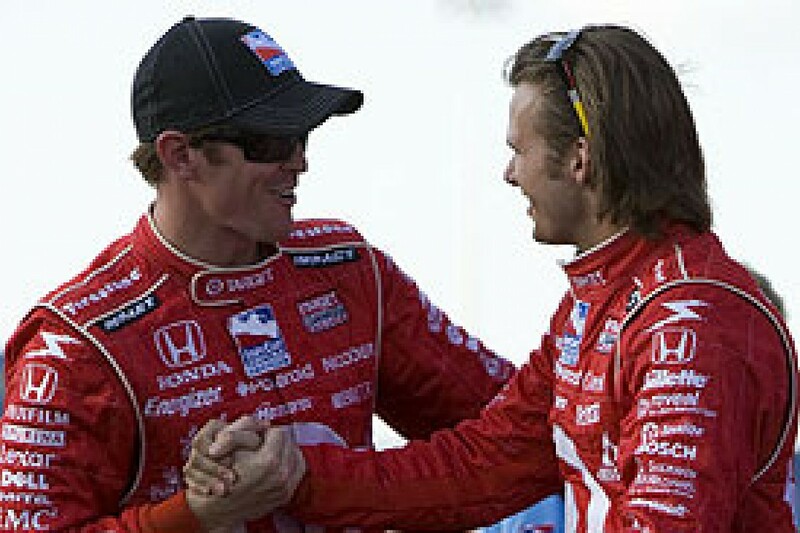 So with the rest of the field either still learning, hamstrung by their equipment, or under-performing, the title came down to Dixon and Castroneves, the latter having churned out consistent podium and top five finishes while not quite having the speed to win in the first half of the year. An outstanding drive from 18th on the grid to second at Richmond got things moving for Castroneves, although he then had to endure a string of technical problems throughout the following Watkins Glen weekend. But he could have won any or all of the next four races had other drivers' better pit timing not restricted him to a quartet of podiums. The breakthrough finally came at Sears Point, where despite racing a back-up car after Penske's transporter was destroyed by fire, Castroneves dominated from pole. He should have won again at Detroit a week later had he not been penalised for blocking Wilson, but this resurgence was still sufficient to put Castroneves on Dixon's tail going into the Chicagoland finale. 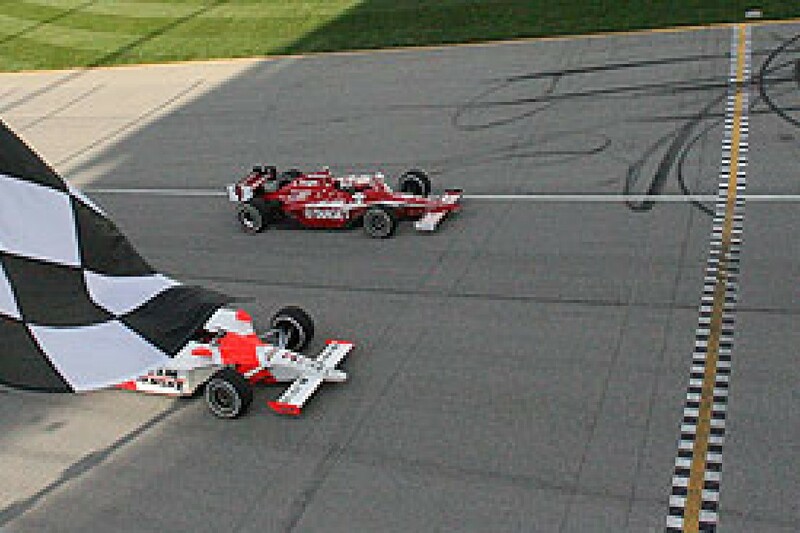 Castroneves' burst of speed had coincided with two poor results for Dixon, who confessed that his Ganassi team had made the wrong calls at both Sears and Detroit as they allowed cautious championship thoughts to cloud their judgement, putting Dixon on strategies that left him stuck in traffic and only 12th and fifth. The stage still looked set for Dixon's coronation at Chicagoland - he led by 30 points, had been quicker than Castroneves at the big ovals all year, and would start second while his rival was put to the back of the grid for crossing the white line on his qualifying run. But Castroneves surged through the field and led much of the race, while Dixon's reluctance to get embroiled in fierce dicing with drivers who weren't title factors saw him fall as low as ninth. He rallied in the final stages though, emerging in the lead after the last stops, and fending off Castroneves' determined passing efforts until the final corner. The Brazilian pipped Dixon on the line by 0.033 seconds (although errant transponder positioning meant Dixon was initially credited with the race win), but by that time it was irrelevant: Dixon was the champion. Any other result would have been unjust given Dixon's year-long dominance. There were few races where he lacked winning pace, and Ganassi's misjudgements in the final rounds were very much the exception. It was, overall, an exemplary season by a driver and team who will be just as hard to beat next season, especially with 2007 champion Franchitti also on board.